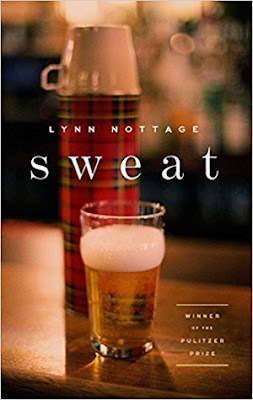 Lynn Nottage’s Pulitzer-winning play Sweat is set in a bar in Reading, Pennsylvania, and shines a light on the once-unionized manufacturing base of America’s industrial engine, once corporations moved operations abroad. The play closed on Broadway in June 2017 after a successful run off-Broadway and around the country. Reading, Pennsylvania, I read somewhere, had one of the fastest de-industrializations and became one of the poorest cities in America. Factories did not give advance notice of their closings, but overnight moved equipment overseas and locked their doors. Workers and management--with mortgages, loans, lives--were just plum out of luck. Nottage shows us a period of eight years at the beginning of the new century when rumors swirled about closing down some of the factory lines—like they perennially did. But the management team was still hiring, and even pulled an African American woman up from the line to give a visual--some sense of upward momentum and overlap between the workers and the higher ups. Then came the screws: shorter hours, lower pay—a forty percent pay cut—or nothing. Advertisements written in Spanish lured strike breakers while the union held firm. Eight years later everything has changed. The factory has closed and the workers we’d seen at the start are battling various addictions—alcohol and opioids…the usual. The woman who had moved into management had several menial jobs, altogether not paying what she’d made before. I especially liked the way Nottage placed familiar points of view or attitudes in the mouths of her characters. The bartender Stan asks a question many have asked: Why don’t you leave this beat-up town where you have only a history and no future? “Sometimes I think we forget that we're meant to pick up and go when the well runs dry. Our ancestors knew that. You stay put for too long, you get weighed down by things, things you don’t need…Then your life becomes the pathetic accumulation of stuff. Emotional and physical junk…. Note Hughes does not say Make America Great Again, but just make it again, live up to the principles upon which it was founded. It is less than that now. Nottage previously won a Pulitzer for Ruined, a play originally conceived as a Bertolt Brecht Mother Courage adaptation and set in a brothel-bar in the Congo. Both sides of Congo’s post-colonialist civil war, soldiers and rebels, choose their night’s pleasure from among the same prostitutes. The more Nottage understood through interviews the horrors of what happened there, the less she could apply the Brecht template and instead created a wholly original work. Pick up or go see one of her plays--she is among our finest artists at work today.